Note: This Tuesday, 22 May, is Maritime Day in the US. 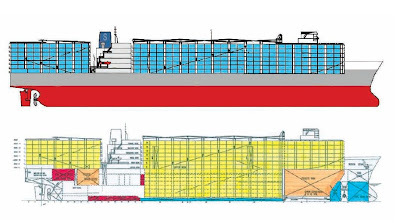 Siba Ships owns the youngest fleet in the world of livestock carriers; the average age of the world’s livestock fleets is more than 25 years. 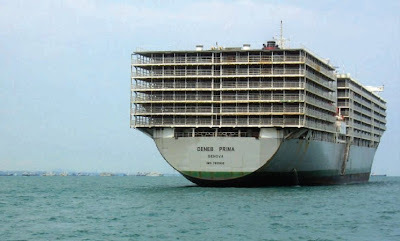 The average age of Siba Ship’s livestock fleet is five years. 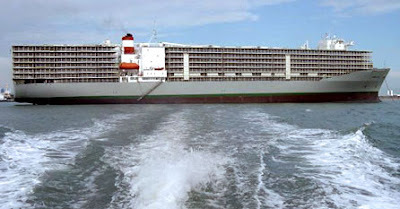 Siba Ships is also home to the world’s biggest and most technically advanced livestock carrier, the Becrux, capable of carrying both cattle and sheep at the same time. The construction of the Becrux was the result of a policy aimed at achieving maximum quality and efficiency while obtaining the best results regarding animal welfare and mortality. 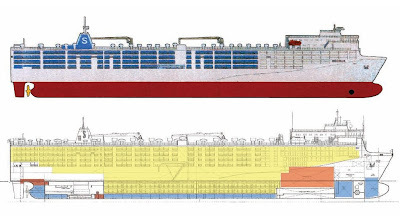 Take a good look at the layout of the DENEB PRIMA. It used to be a containership. That is why the 'house' is back at the stern and the bridge was relocated forward. Eagle Speak has the launch of the armed Nuclear Fuel ship PACIFIC HERON. Once you have read that, be sure to go to his home page and scan the plethora of other maritime stories he has posted over the last week, including "Sunday Ship History: International Ice Patrol"
The New York Post has the sudden death of a SUNY Maritime Cadet on the TS EMPIRE STATE IV just days after it departed for its summer training cruise. CBS News 60 Minutes covers the US Coast Guard's seriously botched modernization Program in "The Troubled Waters Of “Deepwater”". Sadly, this is well-earned exposure. 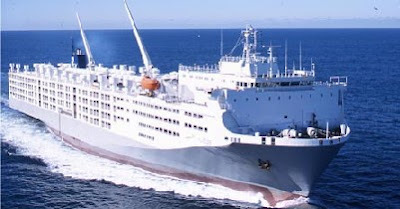 Sailors, Mariners & Warriors League has the ammunition ship USNS SHASTA's rescue of the crew from the MV HAUROSI after it suffered a major engine room fire. The Pilot Boat (at sea) has photos of a Brazilian sunset. Life at Sea has a great post about pirates including a list of famous pirates and modern victims. American Shipper has China's effort to build a fleet of at least 90 supertankers to increase the percentage of oil imported by China carried on Chinese-flag vessels. The BBC has the EU's decision to build its Galileo GPS System using public funds after the attempt to build the system using a public-private partnership has failed. EU Referendum has his two cents about the current developments in the Galileo disaster, including the possibility of taxing or licensing your GPS receivers. Shipping Times (UK) has the sale of Scotland's Viking Offshore to Vroon of the Netherlands. The Yankee Sailor has a serious police raid at the Japanese Naval Academy. CDR Salamander has the USS EARNEST G SMALL and the story about how it lost its bow at sea and lived to sail again. Navy NewsStand has the christening and launch of Military Sealift Command's auxiliary dry cargo carrier USNS Richard E. Byrd. From the Back Nine has Cruise tips from a frequent cruiser. The Space Review has a story on the post-war second life of the WWII Liberty Ship AMERICAN MARINER. 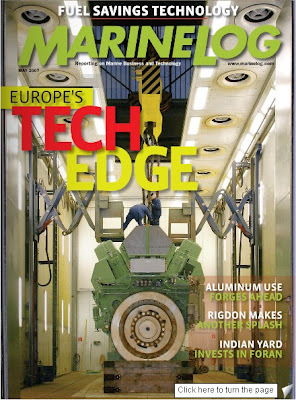 Helsingin Sanomat has"WWF: Finland falls short of target in protecting Baltic Sea"
Snow Tiger's Blog has Ship art.